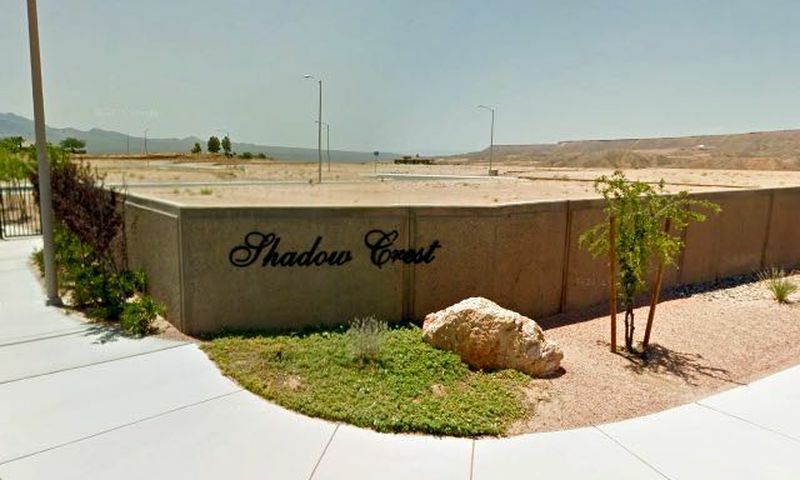 Shadow Crest is a 55+ community in Mesquite, Nevada. With just 105 homes upon completion, Shadow Crest will provide residents with a close-knit community and plentiful amenities nearby. RFMS, Inc. offers residents six home models with the option to customize, giving residents the opportunity to construct the home of their dreams. Shadow Crest is part of the Highland Vistas master-planned community that includes other 55+ neighborhoods. Although there are no on-site amenities, residents of Shadow Crest have the option of belonging to the Mesquite Recreation Center just a few minutes away. The Mesquite Recreation Center has several ways to stay in great shape with two gyms, an indoor pool, aerobics and dance studio, and two racquetball courts. Table tennis is on hand for some friendly competition. Outdoors, the Mesquite Recreation Center offers residents the opportunity to go for a swim in the pool or join a game on the soccer field. Next door to the community is the Falcon Ridge Golf Course, featuring 18 holes of beautifully landscaped greens. Golfers of all levels will enjoy teeing off at the foot of the cliffs or unparalleled views of the rolling hills that surround this par-71 course. The Falcon Ridge Golf Course also provides a driving range and putting green. Scotty's Bar and Grill is the perfect place to grab a bite with friends after a round. RFMS, Inc. is developing 105 single-family homes in Shadow Crest. Available on a new or resale basis, these homes range in size from 1,585 to 3,048 square feet and offer two to four bedrooms, two to three-and-a-half bathrooms, and a three-car garage. These homes boast incredible views of the surrounding mountains, covered patios, and gourmet kitchens. Some homes have private pools in the backyard. Shadow Crest will provide residents with multiple ways to remain physically and socially active. With just over 100 homes, Shadow Crest residents will get to know neighbors quickly and enjoy each other's company. With nearby amenities, homeowners can enjoy group activities like aerobics and organizing soccer games and table tennis tournaments. With the Falcon Ridge Golf Course next door, golfers of all levels can play an easy round with friends or join a competitive tournament. Shadow Crest is located in Mesquite, Nevada, one of the top retirement destinations in the country. The community is conveniently located next to the award-winning Mesa View Regional Hospital. Just a mile away is Interstate 15, making cross-state travel a breeze. McCarran International Airport is about 85 miles away while a Walmart Supercenter is just around the corner. With a hospitable climate and great attractions, homeowners will see quickly why Mesquite is a popular destination for the 55+ crowd. Mesquite hosts several spas, golf courses, and several parks and natural areas. Mesquite sits along the border of Arizona and is only 40 miles from St. George, Utah. Las Vegas and its renowned attractions are just a short drive away, but closer to home Mesquite residents can find plenty of museums, casinos, and restaurants. Shadow Crest provides a quiet active adult community in Southern Nevada. Although Shadow Crest does not have on-site amenities for residents, most homeowners are members of the Mesquite Recreational Center just down the street. The Mesquite Recreational Center is located at 100 West Old Mill Road. The Falcon Ridge Golf Course is adjacent to Shadow Crest. Golf is available on a pay-per-play basis. This par-71, 18-hole course is located at 1024 Normandy Lane. There are plenty of activities available in Shadow Crest. Here is a sample of some of the clubs, activities and classes offered here. RFMS, Inc. is developing 105 single-family homes in Shadow Crest. Available on a new or resale basis, these homes range in size from 1,585 to 3,048 square feet and offer two to four bedrooms, two to three-and-a-half bathrooms, and a three-car garage. These homes boast incredible views of the surrounding mountains, covered patios, and gourmet kitchens. Some homes have private pools in the backyard. Please Note: Not all floor plans are available at this time. 55places.com is not affiliated with the developer(s) or homeowners association of Shadow Crest. The information you submit is distributed to a 55places.com Partner Agent, who is a licensed real estate agent. The information regarding Shadow Crest has not been verified or approved by the developer or homeowners association. Please verify all information prior to purchasing. 55places.com is not responsible for any errors regarding the information displayed on this website.